I’ve been craving Indian food lately, so last weekend I decided to try to make some myself. And I must say…it came out pretty delicious! The Pioneer Woman’s recipe seemed the least complicated and didn’t require marinating the chicken overnight. I made a few tweaks to this recipe, but nothing major. Instead of chicken breasts I used thighs and substituted the rice for cauliflower rice. Mmmmmm! I can’t wait to eat my leftovers. 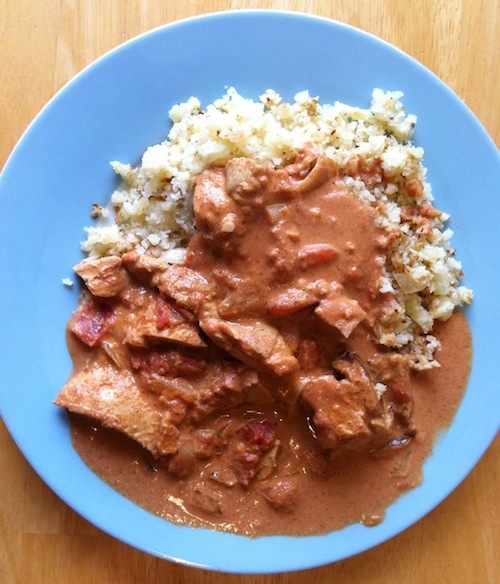 This entry was posted in Uncategorized and tagged cauliflower rice, gluten-free, Indian food, paleo, tikka masala. Bookmark the permalink.